I have noticed a growing trend for people to fish for squid. Whether this trend will grow in fashion, in the same way that dropshotting for fresh water species has, remains to be seen. I used to fish for squid quite a lot when I was younger as squid is, in my opinion, one of the most delicious tasting sea species available to catch. I used to fish for them with rod and line and thought, as it seems to be growing in popularity, I would write an article on what I learnt in my younger days for anyone considering giving it a go. 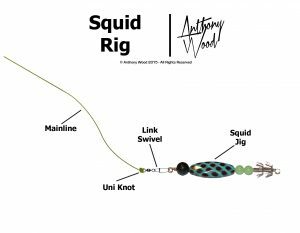 Most of what I write will already be well known by anglers who already target squid but you never know, there may be a bit of knowledge you didn't know. It has unfortunately been far to long since I went and caught fresh squid and these days I tend to buy my squid from my local supermarket (as not living near the sea poses a slight problem lol). There will be a few images in my article and any that are pictures of captured squid being will be provided by Rob Andrew, who kindly offered to use them for me. Okay,so how did I get into squid fishing? Well, my grandad who got me into coarse fishing knew another angler who had been in Japan in the early 70's and had been playing around with squid lures whilst he was over there. When he came back, he had learnt to make his own and was having some success off the piers and out in his small boat in the UK. They were very crude by today's standards, but they caught him plenty of squid and a few cuttlefish as well. I learnt how to make my own lures (which I will show you how to make later on) and I went along with them both and caught some of my own squid. Okay, so how do you go about locating squid and how do you catch them on squid jigs? Squid can be found in the waters all around the coast of the UK. They are, however, more likely to be found in the warmer waters around the south of England, especially around piers, although you can catch them in open water. The time of day is also an important factor as you will start to catch squid just as it gets dark, you may then get a quiet period and activity will again happen around midnight. Squid like to feed in mid water, so it is best to aim at fishing mid water although it is worth trying just above and below as well. They also shoal, so if you catch one there is a very good chance of catching more than one. The best times to fish for squid in the UK are between September and January and you can expect to catch squid averaging 20-30cm. Squid are measured just by the length of their body and not the tentacles. They are also not weighed, as the squid can retain a lot of water as this is what they use to propel themselves thought the water. You may wonder why piers are a good place to catch squid. A lot of people believe the answer is they are attracted to the light of the pier, or it may be that they are attracted to the smaller fish that are attracted to the lights of the pier and the crumbs of food blown in from us humans. Either way, piers are a very good place to try and catch a squid or two. So what special equipment will you need to catch squid? Well, if you're a predator angler, the chances are you already have the equipment you need. You will need a rod capable of casting 2oz-4oz and be around 11ft in length, a reel that will hold 150m of line (there are specialist reels these days but a good front drag spinning reel will work just as well), a good braid of around 13lb (I recommend the Savage Gear Finesse HD in yellow) and a fluorocarbon leader of around 20lb. To tie your mainline to your leader, I recommend using a double grinner knot also known as a uni knot. You have your gear ready but what lure do you need to use? 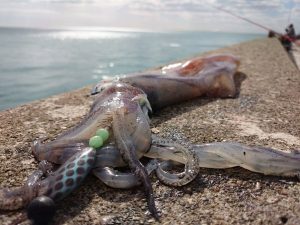 This is where squid fishing differs from other lure fishing, if you are using a lure with treble hooks you may well get a squid to attack your lure, but the chances of actually hooking the squid are very slim (though not impossible). 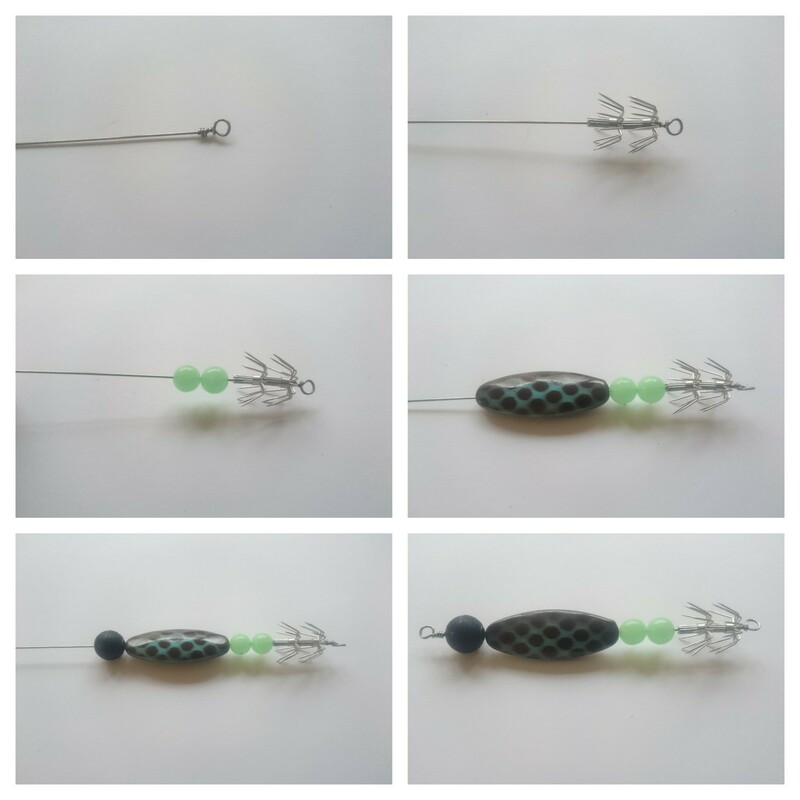 There are literally thousands of styles of squid jigs (lures) available these days, the more expensive ones are probably more balanced and designed to fall at a certain angle but buy a few different ones and give them a try to see which work for you. 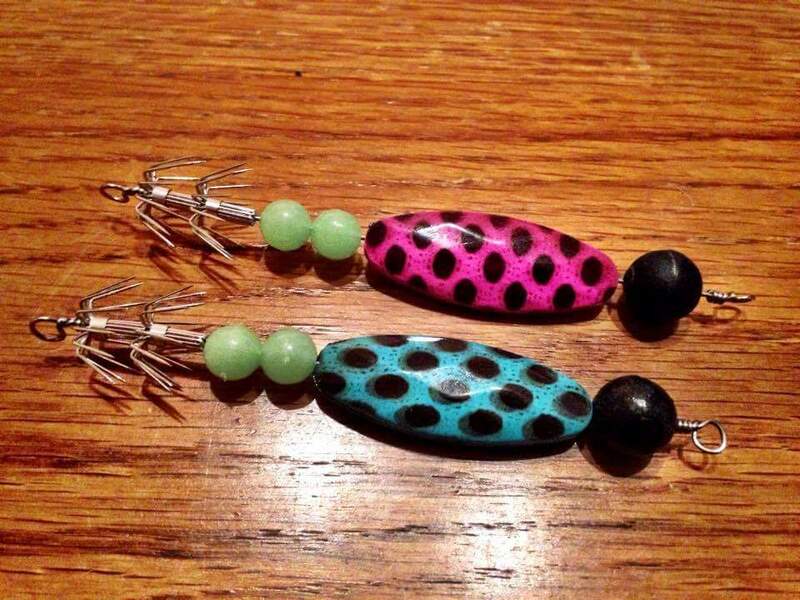 The basic idea of a squid lure is that the main weight of the lure will be away from the special hooks and will actually be near where you attach your line to the lure. 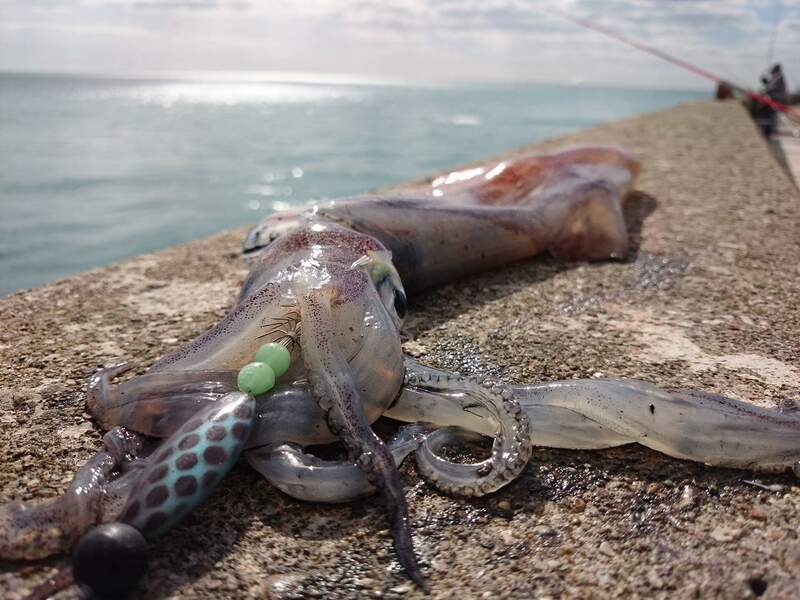 This is because of the way that squid attack a lure, a squid will not bite a lure, it will reach out its tentacles and wrap them around the lure. This is where the special hooks come in as the squid will get its tentacles caught up in the hooks whereas with a treble hook the tentacles may just slip through. 1. Create a loop in one end of the 6" wire using the wire bending tool and then twist the tag end of the wire around the stem four or five times, trimming any excess tag off with wire cutters. 2. Slide the two squid hooks on to the wire with the points facing away from the loop. 3. Slide the two UV chargeable beads on to the wire. 5. Slide the drilled ball weight on to the wire. 6. Create another loop in the wire at the other end as close as possible to the ball weight but that will still allow you to turn the tag end around the main wire stem four or five times, trim the excess wire off and your squid lure is finished. Okay, so now you have the gear, you have the lures but... How do you fish for squid? Well there are probably lots of methods but I have only had experience in two so those are the ones I will briefly explain. The first and probably most easy to pick up method is jigging, this is basically exactly the same as you would retrieve a jighead when fishing for pike or perch. 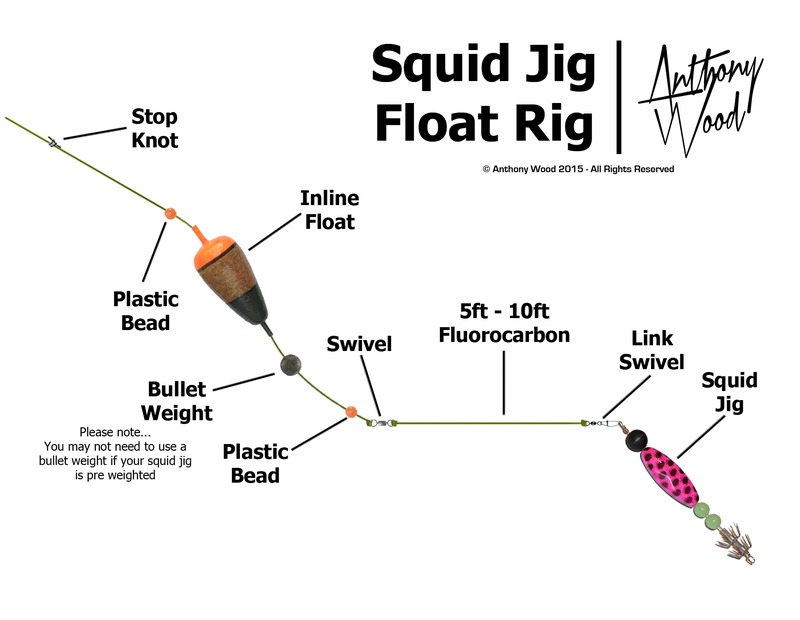 Try alternating the speed at which you retrieve the squid jig once you have cast it out and also try different depths. 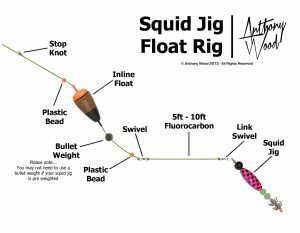 When jigging off a pier it is best to cast out past the reflection of any overhanging light sources and the retrieve your squid jig through the lit area. The next method is float jigging, this is very similar to deadbaiting in the sense that you suspend the squid jig under a float in the same way that you would a deadbait. Try to aim at mid water or just below. 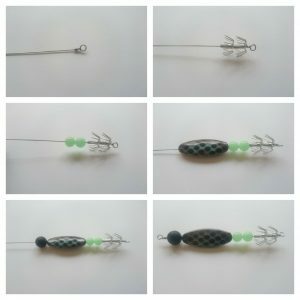 The lure should be constantly moving and when fishing in the sea the motion of the waves is usually enough to give your squid jig the action it needs. When you get a bite (these are quite difficult to describe so just react to either the float dipping under or a slight resistance in your retrieve) resist the temptation to strike and set the hooks like you would with a pike or perch as a squids tentacles are a lot more delicate and you may end up just ripping them off. As you feel or see a bite lift your rod in a soft but firm sweep and start reeling in, you must now keep a constant tension on your line as the hooks aren't barbed and you could loose the squid. When you have your squid at the surface make sure you have a net long enough to reach down or you could loose the squid trying to lift it out of the water. Squid have a defensive attack in the form of their ink, if you do get squirted with ink don't panic just make sure you wash it off before it dries and it will easily come off/out. It's also worth mentioning the beak of a squid as if you aren't careful you will get a rather nasty bite off them. A lot of people catch squid to use as fishing bait which is fine but if like me you love the taste of squid, it is best to despatch them quickly with a long sharp needle though the point between their eyes as this helps to keep a better flavour. When you look at a squid it looks quite daunting but it is actually very easy to do (if a little squeamish). Firstly wash the squid under cold water including inside the hood(body), then holding the head in the palm of one hand and holding the hood in the other head carefully pull the head away from the body. This will also bring the innards out as the head detaches itself from the hood. Once the head is detached from the hood, cut the tentacles away from the head by simply cutting straight down just in front of the eyes. Keep the tentacles and discard the head and innards. Push the beak out and throw it away along with the head and innards and finally trim the two long tentacles down to the same length as the smaller ones. Turning your attention to the hood (body), remove the 'quill' which is a transparent plastic feeling membrane and throw it away. Removing the skin from the hood is very easy, simply grab the wings and strip the skin off slow and steady. Once again wash the inside and the outside of the hood and then place the hood on a flat surface and using the flat back of a knife run the knife from the tip of the hood to the opening to remove any innards left inside. That is your squid prepared. For me the best way to cook your squid is also one of the most simple ways. Take your prepared hood and cut it open on one side from the tip to the opening, open the hood out and carefully score the inside of the hood with your knife being careful not to cut through the hood. If you prefer you can make squid rings and this is down by taking your cleaned hood and instead of cutting down one side leave the hood in one piece and simply cut across the hood creating strips of the thickness you want. In a container that you can put an air tight lid on mix together 8oz corn flour, 1tsp table salt and 1tsp ground black pepper. Doing no more than two squid at a time tip the squid rings and tentacles into the container, place the lid on and gently shake to cover the squid in the flour. Remove the squid from the flour mixture and then place into a deep fat fryer (I use sunflower oil) that has been set on high heat and cook for between one and two minutes.